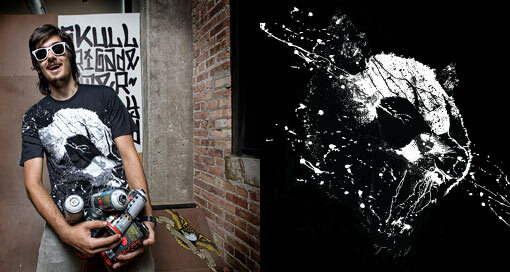 It’s Monday again which means Threadless have released new tees and reprinted some old ones. The good news is that artist Jimiyo has finally gotten recognition at Threadless. His first t-shirt to be printed there is a collaboration effort with AJ Dimarucot aka the110 (of Collision Theory, I believe) and it is a fantastic image of a roaring panda. Yes, I agree that the roaring bear has been done to death but this effort is rescued by its unique artistic styling. The placement of the design is also great. It’s definitely going on my wish list. As time goes on Jimiyo is showing more range and more than ever I am looking forward to seeing what he comes up with next. He has another potential collaboration winner on his hands which you can see on his blog. This other design is a reprint and it reminds me of the Uneetee t-shirt a reviewed a few posts back. 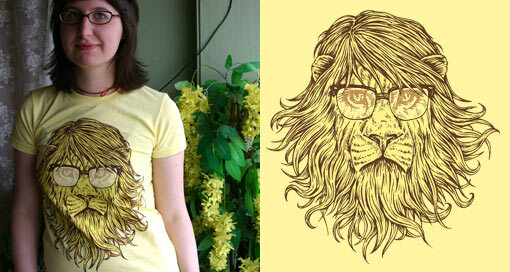 It to a heavily maned lion taking up most of the t-shirt but that is where the similarity ends. This lion looks more like something you would see in a fantasy movie where wise old lions converse with humans on a daily basis. Of course the spectacles lend that effect.